Patty Duke, at one time the youngest person to win a competitive Oscar, was born Anna Marie Duke on December 14, 1946 in Elmhurst, New York. The baby of three children, Anna's mother suffered from severe undiagnosed depression while her father was an alcoholic. The first in the family to go into acting was older brother Raymond. An introduction to his talent managers led to a bit part for Anna at the age of eight. The problem of her heavy New York accent was solved with dialect coaching and she soon appeared in various TV roles and commercials. Anna's big break came in 1958 when she won the demanding role of Helen Keller in the Broadway production of The Miracle Worker opposite Anne Bancroft. The reviews were ecstatic, with Walter Winchell calling the show "an emotional earthquake." It would receive the Tony Award for Best Play and run for two years. Her name now changed to Patty Duke...she reprised her role in the 1962 film version and won a Golden Globe and the Academy Award for Supporting Actress at the age of sixteen. Her raw talent was apparent and startling. This accomplishment led to The Patty Duke Show, which debuted in September of 1963. The sitcom, about identical teen cousins, was a hit in the ratings until its cancellation three years later. Together with a successful recording career, Duke was one of the top adolescent stars of the day. She was thrilled to win the coveted role of pill-addicted Neely O'Hara in the 1967 film adaptation of Jacqueline Susann's Valley of the Dolls. But the experience was a miserable one for the actress and the movie was widely derided by critics. The big screen career she had hoped for was not to be. However, Duke found great success in Made-for-TV films including a number of thrillers. In 1972's She Waits, she played Laura Wilson, a young bride who (having been taken to the family mansion by her husband) learns she is possessed by the vengeful spirit of his dead first wife. She was in the theatrical picture You'll Like My Mother (also 1972), playing a pregnant and newly widowed woman who travels to snowy Minnesota to meet her mother-in-law. Stranded in the house and less than welcome, her world soon turns into a nightmare. During the early seventies, Duke appeared in various suspense series, including Night Gallery, The Sixth Sense, Wide World of Mystery and Ghost Story. By this time, she had married actor John Astin and taken his name. 1974 saw her in Nightmare, a television variation on the Rear Window story in which Richard Crenna co-starred as a murder witness who can't convince the police that a killer lives in the apartment across his courtyard. Two years later, she was cast in Look What's Happened To Rosemary's Baby, an underrated sequel to the Polanski classic. Stepping into Mia Farrow's shoes, Duke did a more than admirable job. Killer on Board (1977) concerned panicked passengers on a cruise ship threatened by a deadly virus. That same year, Duke co-starred along with Donna Mills in Dan Curtis' Curse of the Black Widow, a fun throwback to the science-fiction horror of the fifties. In 1980's The Babysitter, directed by Peter Medak, Duke was excellent as an alcoholic who succumbs to the deadly charms of her daughter's live-in nanny (played by Stephanie Zimbalist). William Shatner was her husband in the suspenseful movie. Duke's resume includes a stint as President of the Screen Actors Guild (SAG) beginning in 1984. 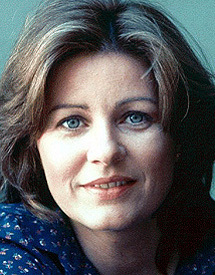 There would be many more interesting and varied roles - and in 1987, she published a best-selling memoir, Call Me Anna. One of the few child actors to become a successful adult star, Patty Duke continues to act and is a spokesperson for mental health and depression.